"I take this recipe to family and friend get togethers and it's always a hit. It's quick to put together. Serve it with an assortment of crackers, or try it with green olives." 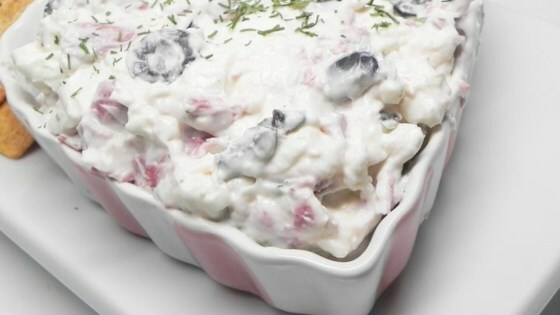 Place the cream cheese, sour cream, milk, horseradish, onion, and dill in a bowl, and stir until well blended. Gently fold in the beef and black olives. Cover and refrigerate 2 hours, or overnight to blend flavors before serving. I used this over the holidays. It was good. Next time I may use more horseradish, but overall, it was excellent. Not sure if I would make again. My husband and I cringed at the sight of the dried beef, but boy did we eat the heck out of this dip!! VERY TASTY ~ I added a bit more horseradish, but it was awesome on day 2! Thanks! This was easy to whip up and you could jazz it up with an assortment of different crackers. My friends asked for the recipe. As other posters noted, this is a tad bland for my tastes so added 1 tsp of Worcestershire sauce for a bit more robust flavor. This dip is great! I've made it twice for parties and everyone's loved it! My husband thought this was very good. I found it to be a little bland, lacking a zing flavor, will try to doctor it up a little next time.